“Who says indulgent can’t be healthy?” ask the makers of Sahale Snacks. And there is no better way to describe their nut-based snack packs: indulgent and healthy. My healthiest snack intentions are sometimes derailed. Bananas and nuts are great, but after a month or so – YAWN. Sahale Snacks provides something a little more exotic to fill your tummy and your taste buds. Plus, Sahale has a wide diversity of snacks, which is great for anyone who has ever been in a snack rut. My favorite is the Soledad Almond Blend – which has a serious cayenne punch to it, but I also really like the Socorro Macadamia Nut Blend – a smoother, more savory blend of macadamia nuts, hazelnuts, papaya, and mango. 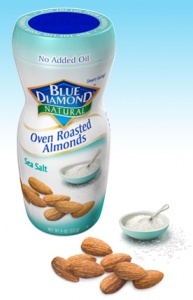 Almonds: protein, vitamin E and a crunch. Flax Seeds : omega-3 polyunsaturated fatty acid; big on protein and fiber. Dates: fat-free, cholesterol free sweetness with energy from carbs, plus a good source of antioxidants and fiber. Balsamic: low-calorie, fat free flavor that may help boost calcium absorption and aid digestion. Cayenne: Mainly here for the kick, but in larger quantities has been suggested to improve blood flow. Taste, nutrition, and diversity. This is a great addition to your snack regimen. The nuts are healthy and add a good crunch factor, while the dried dates add a sweet and chewy counterbalance. Plus, the flavors are really unique for a snack, balsamic vinegar and cayenne aren’t your typical snack ingredients. I also really like their ingredient list, which other than the main ingredients I listed above, only includes tapioca syrup, organic evaporated cane juice, organic white distilled vinegar, sea salt, and honey; a list that is not too complicated and doesn’t include anything I wouldn’t usually eat. There’s nothing like a good multi-tasker to make you feel on top of things. And in the spirit of multi-tasking, I bring you a kid-friendly, grownup-friendly,HEALTH-friendly snack that satisfies my hunger pangs with little inconvenience. Let’s examine it as a three parter, shall we? First I’ll hit the health angle, then move on to convenience (because let’s face it, rarely do we have time to get all gourmet at snacktime), and finally, taste. As for the kid-friendly stuff … well, that’s mostly advertising. As you can see, this is a snack with some personality – Dora the Explorer’s personality, that is. I’m talking about individual packets of Frozen Edamame made by Seapoint Farms. These edamame snacks come shelled in packages of eight, each one containing a 1 ½-ounce serving, perfect for carrying around. If you don’t have little ones, never mind the picture, it’s what’s inside that counts. Not too bad, huh? I was impressed by there being only 59 calories in each pack because they actually are satisfying. And only 2 grams of fat – phew, plus no trans fats and no cholesterol. And to wrap it up, there are 5 grams of protein per pack, which is especially good news if you’re buying these for your kids, because protein is an essential building block for bone, muscle, and cartilage. Protein also helps to fight hunger, which is an important part of your snack’s job. I don’t know about you, but I’m impressed, these edamame packs are good for you and utterly guilt free. Is it easy to prepare and eat? I recently started a new job and sadly, the new establishment does not have the smorgasbord of snacking options that the other was so kind to maintain. Luckily though, in this snacking void I have found one treat on hand that is perfect for the days when you need some serious crunch with a bit of spice. Snyder’s Honey Wheat Sticks Pretzels are salty and slightly sweet with the crunch of a serious pretzel. The calorie count here for one serving seems about average, and since it’s a filling serving, no real damage done. It’s also great to find a snack with some sweetness without breaking the sugar bank. As for fiber, I’m certainly glad it showed up for the party, but since the recommended daily allowances for fiber are around 25 grams, the two grams here are no big revelation, though they are appreciated. The 3 grams of protein are also nice to have in a snack, so overall, I think it’s a pretty safe bet. I wouldn’t rely on them for my nutritional needs, but they have contributed, while doing little harm as a snack. Brown mustard is just the kick that these subtly sweet sticks need. It’s just a bonus that this dipping condiment is low in calories (1 tablespoon contains about 15 calories) and has no fat and no sugar! The natural grazer within is calmed as these delicious sticks can carry me from one meal to the next. I recently spent time in Italy, where, not surprisingly, I ate really well. One of the things that struck me most about the food was its simplicity. Italians generally aren’t into complicated preparations—no fancy sous-vide cooking methods or heavy sauces; they prefer to just use a few high-quality, fresh ingredients, and let those ingredients speak for themselves. For example, to make a delicious margherita pizza, Italians basically just use flour, yeast, salt, olive oil, tomatoes, basil, and mozzarella. Forget the processed cheese blends and jarred sauces we use in the U.S.; they’re all about natural flavors and goodness. This food principle, that beauty lies in the simplicity, doesn’t just apply to an Italian’s meals but to snacktime, too. When in Rome, I peered around some grocery stores, and I noticed there weren’t thousands of brands of processed snack foods like we have here. An Italian friend explained to me that they’re more likely to have “real food” as a snack, like a small sandwich, instead of a big bag of chips and dip. And if they do eat a packaged snack, it’s usually something pretty simple, like bruschetta or crostini crackers (which are the same concept as bruschettas you’d get in a restaurant–bread with oil, tomatoes, and basil—but in cracker form). I saw several brands of these treats in Italy, and when I returned home, I was happy to discover that similar kinds of snacks are sold in the U.S., too. I had just never noticed them before, amidst the twenty-thousand other chips, pretzels, cookies, etc. we have here. I’ll admit that I get chocolate cravings a lot. Sometimes I want a simple piece of dark chocolate. Once in a while, I have a hankering for fudgey ice cream. And often, I crave a gooey brownie. Since my craving for brownies strikes pretty regularly, I can’t always satisfy it with a real, delicious, fattening brownie, or I’d surely pack on the pounds. I try to stick with healthier brownies during the week, and then have a more indulgent kind on weekends (and sometimes Thursdays end up counting as part of the weekend!) and special occasions. Here’s a roundup of four of the healthiest chocolate brownies I’ve tried—a ready-to-eat one, two frozen varieties, and an easy baking mix. Quick Facts: One brownie has 100 calories, 4 grams fat, 7 grams of fiber, 4 grams of protein. Ingredients: Contains mostly organic, recognizable, and natural-sounding ingredients, such as organic cocoa, organic soy flour, organic butter, organic whole eggs, organic milk chocolate chips, and organic evaporated cane juice. Tastes Like: Slightly drier version of those thin Entenmann’s single fudge brownies. What I Liked: These are easy to eat on the go. And since one brownie has only 100 calories, you can have one anytime without feeling guilty. What I Wasn’t Crazy About: They’re kind of thin. I generally like thicker, gooey-er, chunkier brownies. I finished it really quickly and wasn’t fully satisfied. They do taste pretty chocolately, though. Kellogg’s health-focused Special K brand has been expanding beyond breakfast foods lately. First, they came out with meal bars and protein water. Now, they’re moving into the savory snacks category with the launch of their new crackers, in two varieties, Multi-Grain and Italian Tomato & Herb. 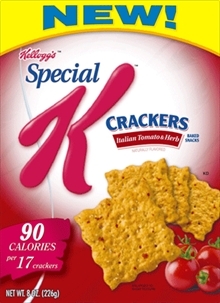 I like Special K products (I often eat the plain cereal or the bars), so I was excited to give these crackers a try. I love popcorn, but I never really make it or buy it as a snack because I eat too much of it! 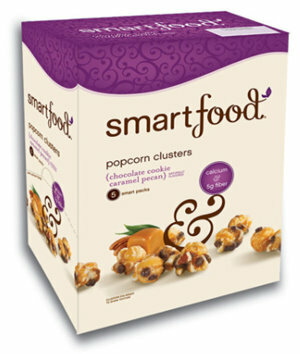 (Yes, it’s low in calories for a single serving, but one of those microwave bag has three servings, and I usually eat the whole thing…) That’s why I was glad to hear that SmartFood started coming out with single-serving Popcorn Clusters, in three different flavors.